Len joined the club in 1984 and served as Treasurer for many years. He was awarded life membership of the club for his exceptional service and remained an active member of the club as long as his eyesight allowed. and Scott, Ben and Emma. We all have so many happy memories. Remembered with love and always in our hearts. Len was born at Harrow, (London) England on December 26 1923. He spent his childhood days and was educated in Harrow. His father worked in the railways and Len followed in father’s footsteps when he got employment with the LMS railway. During WWII, he served in the Royal Marines and was demobbed in 1946. Married in 1948, Len’s first child (a boy) Steve was born in 1953. Len also worked for the US Pennsylvania Railroad and when he migrated to Western Australia in 1955 he worked briefly for the WAGR. His daughter Karen, was born in 1958 as a “true blue Aussie”. In Western Australia, he worked for Caltex oil in product delivery and then he ran the Caltex Balcatta depot for a number of years. His marriage folded in the 1970s and then through his involvement in Rotary, he met Bev, who became his long time (over 30 years) travelling companion and partner. Len joined WAMRC in 1984 and he was Treasurer for a number of years. It was Len’s idea that the Club put some of the takings from the Royal Shows into an investment account “for a rainy day” should we need it in the future. Over a number of years funds were put into “the rainy day fund” and indeed the rainy day came in 1996 when we were advised by the Royal Agriculture Society that our land was required and we had only two more Royal Shows in our building. We owned the building but the land belonged to the RAS. Our “rainy day fund” initiated by Len, had enough money in it to pay for the building that the Club has now at the Rail Heritage Museum at Bassendean, after a couple of years where the Club had no permanent home. Len was made a Life Member of the Club, an honour that he was very proud of. 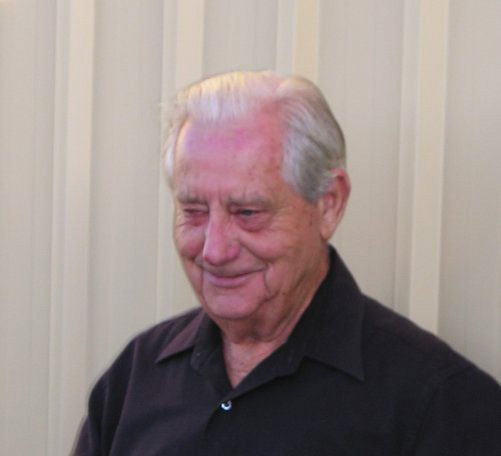 Also on the model railway side, Len was one of the founder members of the “Arid Australia” group and until the 2017 AMRA exhibition had taken an active part every time the layout had been displayed except the 2016 AMRA exhibition when Bev bought him in to check “that we were doing things right”. He was not well enough to check on us at the 2017 exhibition, but I’m sure he would have been thinking of our exhibiting of the layout. Len’s modelling skills were such that he built the model of the Hamersley Iron Railroad’s Spring Creek bridge and then he was the instigator in the construction of the Robe River Railroad’s bridge over the Fortescue River. Both these structures (large and impressive) were a credit to his modelling skills. In his latter years due to deteriorating eye sight, Len was unable to drive and relied on other Club members to get him to the Club. Len’s foresight in establishing the “rainy day fund” for the Club has ensured our continued existence and we (the Club) are forever grateful to Len’s vision in this regard. This obituary was prepared by club life member Don Finlayson.